Day Out with Thomas – Event Info. Preschoolers will get the thrill of their lives when Thomas the Tank Engine steams across the country this year. Thomas and his friends will be at the Grapevine Railroad two back-to-back weekends, March 28-30 & April 4-6, 2014. When Thomas arrives at Historic Downtown Grapevine for the Day Out With Thomas: The Thrill of the Ride Tour 2014 , he will not only take his fans for a ride, but also talk to them for the very first time on the tour! Day Out With Thomas: The Thrill of the Ride Tour 2014 is a fun-filled event that provides children of all ages the opportunity to climb aboard and take a ride with Thomas as well as participate in Thomas & Friends themed activities. The tour, now in its 19th year, will make stops in 42 U.S. cities and is expected to welcome nearly one million passengers in 2014. For two back-to-back weekends, little engineers and their families are invited to take a 25 minute ride on their favorite engine, meet Sir Topham Hatt, Controller of the Railway and enjoy a day of Thomas & Friends themed activities including arts & crafts, storytelling and more. The Grapevine Vintage Railroad will also offer live stage music & magic shows, a petting zoo, Island of Sodor Sandbox Dig!, a huge model train layout, and more! Thomas Train Ride Ticket Info. Thomas the Tank Engine rides depart every 45 minutes, rain or shine. Departure times begin at 9:00 am through 6:00 pm each day of the event. 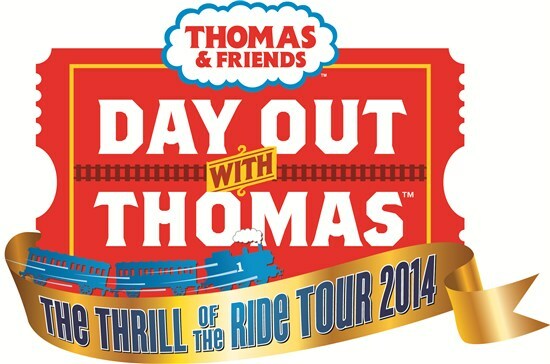 Tickets for the Day Out With Thomas: The Thrill of the Ride Tour 2014 are $17-22 plus tax for ages two and up. Tickets are on sale now by calling toll-free 866.468.7630 or logging onto www.ticketweb.com/dowt. Would you like Tickets to See Thomas? 3. Leave a comment below with a link to the url of your shared post (click on the grey time stamp of the post to get to the URL). Contest ends on Tuesday, March 18th @ midnight CST. Winners will be notified by email (the one you use to leave the comment below) and must respond ASAP; otherwise prize is forfeit! Would love to win these tickets! We are super excited that Thomas is coming to town! I want to have great day with my kiddo! I hope I did this right!!! My kids would love this!!!! Oh, we have 2 little 3 year old boys that would be thrilled to win these tickets! Can’t wait to see Thomas! Would love to win this for my HUGE Thomas fan!!! Here is my link! Hope I win!! Would love to see Thomas with my 4 year old son who is the biggest Thomas fan ever!!! Let’s try this link again for my favorite 4 year old boy in the world!! My boys have never been and would LOVE to go! My son would LOVE to win!! My son would be in heaven seeing Thomas in person and an actual train ride on a real train would blow him away. He points out all things train related when we pass (crossing signs, tracks, etc. ), and he and his buddies love to play with all the Thomas and Friends trains. Our little guy is going to go crazy when he sees Thomas in real life! To include the FB link…. Is it wrong to be just as excited about this as my son? Here’s our link! Noah and I would love to win Choo choo’s are my little fellas favorite! We love Thomas !! Shared! I will Love to win the tickets for my son! We would love to win tickets. Please pick us. My 3 year old loves Thomas. This would be such a fun family adventure. This is corrected link. Would love to win. My 3 year old loves Thomas! Is this the right URL? I hope so, cause we’re excited about Thomas coming to town! Thanks for participating everyone! Look for another great giveaway from North Texas Kids soon!